World in Conflict has been out for a few years now (September 2007), but I’ve been meaning to write down my feelings about the game and since it was so damn addictive, why the hell not? WiC is a WW3, Russia-invades-America-yet-again story with a hell of a lot of soldiers, tanks, helicopters, airplanes, and explosions to keep you coming back for more. Russia have decided to take over the world again (seriously, with the amount of fiction based on this, you’d think someone actually wants this to happen…) and it’s your job as an American officer to send thousands of men to their impending deaths to stop the communist menace in its tracks. The vanilla American campaign (I haven’t touched the Soviet campaign, yet) is a lengthy 14 missions completely devoid of base-building or resource gathering, and focussed entirely on control-point-capturing carnage, each one with a number of sub-objectives to make it twice as interesting, and to test your competence in commanding your forces effectively, even when spread thinly across the map. Somehow I made it to the very end of the game collecting every single medal – even on hard! – except for ONE; one damn medal I didn’t get, because I forgot to hold some damned train station somewhere or other. Still, I was pretty proud of the overall achievement because it was no easy feat making it to the end of World in Conflict on the hardest setting; the enemy are ruthless, relentless, and ruddy resilient to your near-futile attacks, making the game bloody challenging to beat as a whole. Thankfully, I had a fantastic arsenal of support abilities to call upon in the heat of battle. One of the key features of WiC is your ability as a commander to call in a variety of off-map support strikes against your enemy. Got a column of tanks rolling down the road toward one of your strongholds? Just hit the ‘tank-buster’ button, place your targeting marker in the best angle to hit the enemy, and moments later an A10 Warthog support plane will swoop in from the skies, tear up the ground with a hail of armour-peircing heavy-minigun rounds, leaving behind a now redundant column of charred, mangled, smoking metal. Sweet! The story of World in Conflict wasn’t anything particularly amazing. I’ve played enough games about the invasion of America by communist nation X or Y for it not to really feel unique. What became really interesting instead, though, were the private lives of the individual characters throughout the game. Despite all of the ‘big’ stuff going on in the background – cities being invaded/destroyed etc. – the personal dilemmas of specific people in WiC are where the real emotions and clever storytelling is. The tale of one ‘Captain Bannon’ – a total douche I might add! – evolved into what was the most intriguing story with a cool, opinion and emotion changing turn-of-events that were nicely written. Despite being a few years old now, World in Conflict still looks fantastic, with some beautiful special effects and decent looking in-game cutscenes to admire mid-mission, and so there’s certainly nothing about it to put you off if you have an up-to-date machine to run it on. If you can find it cheap, then I highly recommend getting your hands on it, because it was about a millions blasts of various explosive compounds from start to finish. 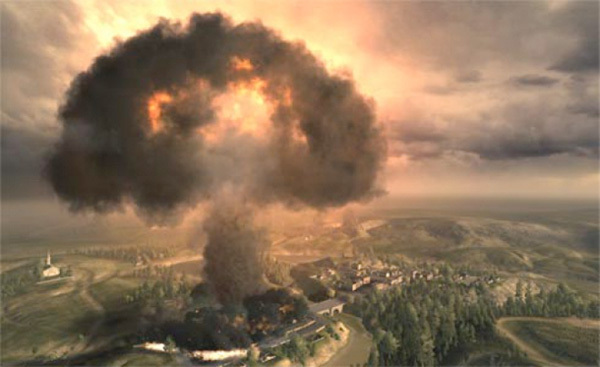 This entry was posted in Game Reviews and tagged review, RTS, World in Conflict. Bookmark the permalink.